Convert the dotted-decimal representation of the netmask to binary. Then, count the number of contiguous 1 bits, starting at the most significant bit in the first octet (i.e. the left-hand-side of the binary number). The prefix of 128.42.5.4 with a 255.255.248.0 netmask is /21. The network address is the logical AND of the respective bits in the binary representation of the IP address and network mask. Align the bits in both addresses, and perform a logical AND on each pair of the respective bits. Then convert the individual octets of the result back to decimal. You haven’t given enough information to calculate subnets for this network; as a general rule you build subnets by reallocating some of the host bits as network bits for each subnet. Many times there isn’t one right way to subnet a block… depending on your constraints, there could be several valid ways to subnet a block of addresses. In this example, we know that you need at least a /25 prefix to contain 100 hosts; I chose a /24 because it falls on an octet boundary. Notice that the network address for each subnet borrows host bits from the parent network block. Since IPv4 addresses are 32 bits wide, and we are using the host bits (i.e. least significant bits), simply subtract 7 from 32 to calculate the minimum subnet prefix for each subnet… 32 – 7 = 25. Since we only want four subnets from the whole 128.42.0.0/21 block, we could use /23 subnets. I chose /23 because we need 4 subnets… i.e. an extra two bits added to the netmask. This is what we’ve already done above… just reuse the host mask from the work we did when we calculated the broadcast address of 128.42.5.4/21… This time I’ll use 1s instead of h, because we need to perform a logical AND on the network address again. The reason we subtract 2 above is because the all-ones and all-zeros host numbers are reserved. 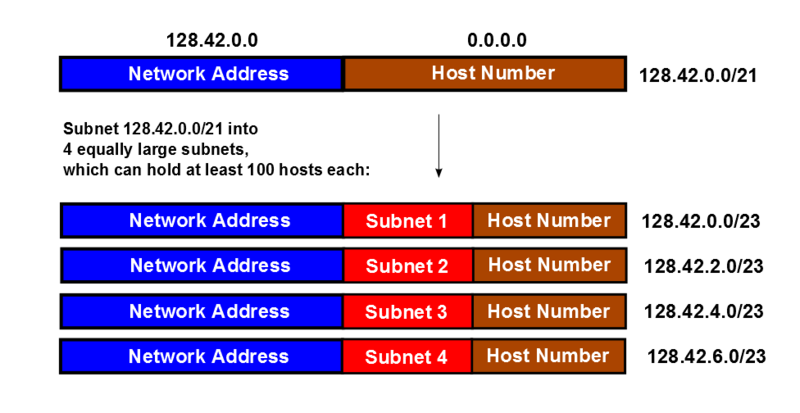 The all-zeros host number is the network number; the all-ones host number is the broadcast address. The easiest thing to do is to convert both to binary and look for the longest string of network-bits from the left-hand side of the address. NOTE: If you try starting from the right-hand side, don’t get tricked just because you find one matching column of bits; there could be unmatched bits beyond those matching bits. Honestly, the safest thing to do is to start from the left-hand side. Setting up my django development (basic). The following steps assuming that Python is installed. Django 1.7, mysql-python and the pycharm editor should now be ready to use!